This post originally appeared on Vital Signs & Statistics, a United Church of Christ blog. In 2018, the United Church of Christ is comprised of nearly 5,000 congregations. Based on the 2018 yearbook data, the congregation count was 4,956 congregations as of December 31, 2017. Looking back over the past six years (2012 – 2017) the number of congregations has declined from 5194 to 4956, a net loss of 238. However, just looking at the net loss doesn’t tell the whole story of what’s happening with congregations in the UCC. Thankfully, the UCC Center for Analytics, Research and Data (CARD) compiles a church status change report each year based on the annual yearbook reports that gives greater detail behind the congregational count. I have followed the status change reports since 2006, when I began studying congregations that joined as well as left the UCC during the first phase of our God is Still Speaking campaign. The Status Change report compiles information on congregations that have received standing, merged, closed, withdrawn, been removed or proposed. One hundred congregations received standing in the UCC from 2012 through 2017. The number of churches received matches the 102 congregations received in the six previous years 2006 through 2011. These congregations include newly organized churches and ministries well as existing churches affiliating with the UCC. The existing churches that affiliate come from independent backgrounds, as well as congregations from other denominations seeking dual affiliation or congregations leaving their previous denominations. Due to our ecumenical and inclusive nature, the UCC has a unique place among other denominations of welcoming and receiving a significant number of churches seeking to join the UCC[i]. Recent affiliating churches include 7 congregations of the Reformed Church in America in New York that joined the UCC. The one hundred churches gained also included 5 congregations receiving standing that come from historic congregational relationship within the UCC[ii] that during the 1957 merger either voted not to join or never voted, but now voted to join. Sixty-nine Proposed Congregations were also reported in 2012 – 2017. A proposed congregation is a new or affiliating congregation in the process of formation and/or affiliation. They are recorded in the yearbook and directory[iii] and Data Hub, but are not included in the congregational count until they received standing. The sixty-nine proposed congregations are an increase from the fifty-six congregations reported in the previous six years 2006-2011. Not all proposed congregations receive standing, but they indicate a steady stream of oncoming congregations preparing to join UCC. The one hundred churches received and sixty-nine churches proposed from 2012 – 2017 represent positive and dynamic growth in congregations of the UCC. In many ways, these new ministries are early indicators of emerging practices of being church today[iv]]. From 2012 – 2017, twenty-one UCC congregations merged together to form fourteen congregations with UCC or other denominations’ congregations. In most cases, one congregation merged with another, but there were three UCC congregations that came together to create one new congregation. The other denomination churches that UCC congregations merged with were United Presbyterian (2), Evangelical Lutheran Church (2) and Disciples of Christ (1). The twenty-one congregations that merged are a decrease from the thirty-seven merged congregations from 2006 through 2011. The decrease may reflect that congregations are exploring new cooperative ways to work together other than previous merger models. The merging, adopting, and cooperative uniting experiences in congregations call for further research and study. One hundred fifty-five congregations ended their active ministries and closed between 2012 and 2017. That is comparable to the one hundred sixty-four congregations that closed between 2006 and 2011. Over the past twelve years a congregation has on the average closed every two weeks. In response to today’s challenges for congregations, there have been resources created for assessment, revisioning, closure and legacy including the Living Legacy workbook. Closed congregations represent a loss not only to their members and the UCC, but also to local communities.The loss of a congregation and facilities is the loss of spiritual presence, community services, and a building that provides a gathering place for the community and local organizations [v]. There is growing attention and discussion to creatively saving church space for missional use even as congregations decline. Congregations of all ages come to the end of their ministries, including new ministries and churches that close in their first formative years. New ministries close for many reasons during the first seven years of existence before receiving standing. It is unfortunate, but not surprising that thirty-three proposed congregations closed from 2012 through 2017. Starting new ministries is difficult and is much like venture capital investment in risk, but necessary for our future. 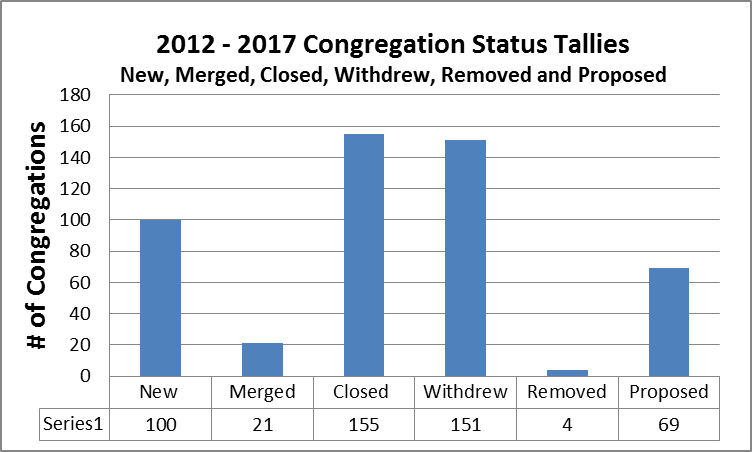 One hundred fifty-one congregations withdrew from the UCC from 2012 through 2017. Churches withdraw transferring to other denominations or becoming independent often out of disagreement with UCC. Although one hundred fifty-one congregations is a significant number, it is less than half of the three hundred sixty congregations between 2006 through 2011, which included two hundred forty-nine congregations that withdrew in 2006/2007[vi]. 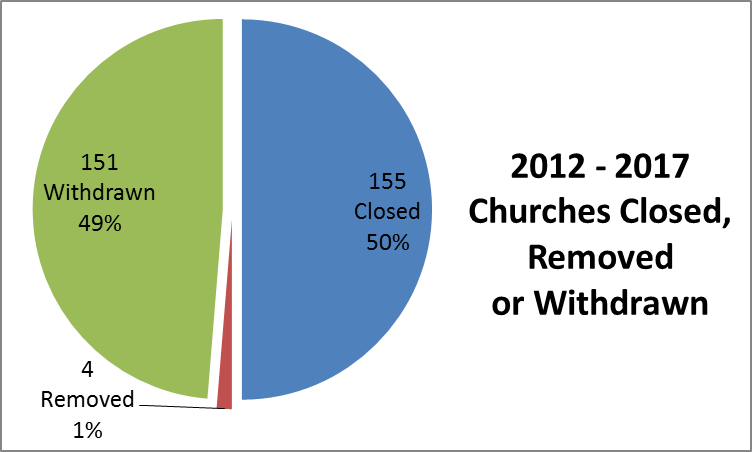 Since 2008 there has been a reduction in the number of congregations that have withdrawn on an average of 26 churches a year. Comparable to churches that closed from 2008 through 2017, a church has withdrawn from the UCC on the average of one every two weeks. Four churches from 2012 through 2017 were removed from standing by their conference or association. Two of these congregations were removed because their association was unable to locate or contact any members. Although churches often leave after a time of extended distance, disagreement, and sometimes anger with the wider church, there are some churches that make the decision to depart in communication with their conferences. In the UCC we recognize that congregations will not agree. Facing the continuing withdrawal of twenty-six congregations each year, I wonder if in suitable situations there could be or have been recognition and a ritual for churches leaving. The current net loss of the congregations in the UCC follows the Futuring the United Church of Christ: 30 Years Projection – Draft Report created by CARD in 2015[vii]. When you dig into the detail beyond the net loss, however, there’s good as well as difficult realities that inform and raise questions for our current and future ministry together.